During my conversation with Perry via telephone from his home in Boise, it becomes clear that Trey McIntyre Project — a contemporary dance group comprised of five men and five women between the ages of 19 and 34, 12 staffers and founder Trey McIntyre — values a sense of community. It was this inclination to engage that led Trey McIntyre to partner with New Orleans’ Preservation Hall Jazz Band Creative Director Ben Jaffe for their 2010 Hollywood Bowl debut. Over the past year, the two creative powerhouses have been working together again. On Nov. 22, they will perform their new collaborative work celebrating the distinct culture of New Orleans at Walt Disney Concert Hall. Originally from Indiana, Brett Perry has been with Trey McIntyre Project since it launched full-time in 2008. He started dancing at 4 and landed a hot spot at the Juilliard School after high school. In his senior year, he met Trey McIntyre, and after taking his class, loving it and having a two-hour conversation with the choreographer at Starbucks, Perry accepted McIntyre’s offer to join the Project. This year, the company has experienced an especially high turnover rate: three new dancers. “It’s exciting because they bring in brand-new energy, movement quality and visions of what they can bring to the dance company,” says Perry. For their Los Angeles appearance, Trey McIntyre Project will perform two pieces, “Ma Maison” (French for “my house”) and “Sweeter End,” with the Preservation Hall Jazz Band. Preservation Hall will also play an additional third set of newly composed music. The Project and the Band have also previously performed the second piece, “Sweeter End” together — in February in New Orleans. It focuses more on post-Katrina New Orleans. “There was graffiti that came out of the post-Katrina era, a big X on a lot of the houses and buildings, and Trey and designer Andrea Lauer were fascinated by this.” In this piece, a big spray-painted X makes an appearance. 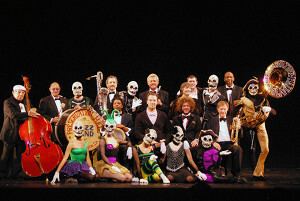 For Halloween this year, the Project joined Preservation Hall in New Orleans for the Voodoo Fest. “It’s a whole ’nother crowd and new audience,” says Perry, who is more familiar with traditional theaters than festival grounds. Without a rehearsal with the band, they hit the stage and performed to a lively audience walking, talking, carrying beers and dressed in costumes, in an even louder environment with multiple bands playing at once. HBO’s “Treme,” which chronicles the life of New Orleans residents three months after Hurricane Katrina, offers insight into the city’s tradition of second line dancing when it’s done after a funeral. People file down the street from the cemetery in a line filled with people dancing and musicians playing upbeat compositions. They say it is performed to aid the dead person’s soul in passing over to the afterlife. The living spectators also have to keep moving to avoid their souls being caught. These beliefs may have inspired McIntyre’s “Ma Maison.” Whichever the sparks, Trey McIntyre Project’s pieces overflow with elements of New Orleans culture, both the celebratory and the sad.